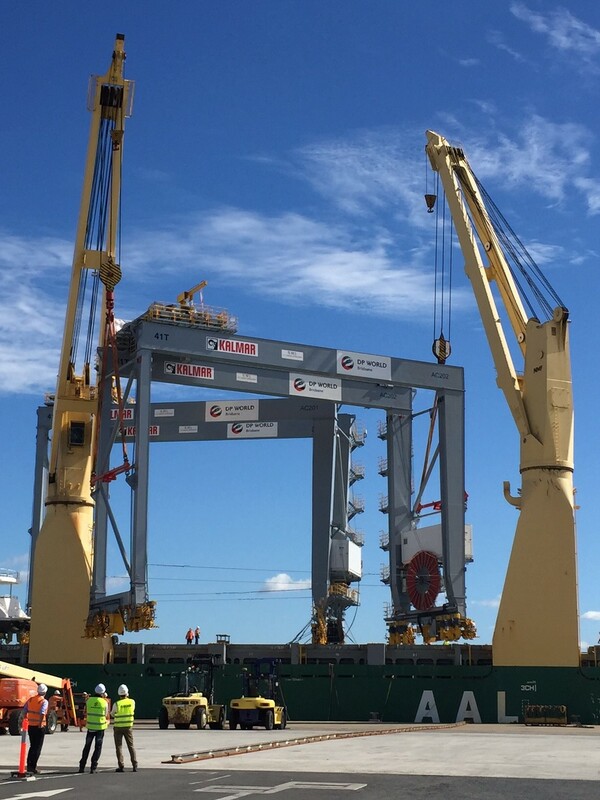 Kalmar, part of Cargotec, is pleased to announce the phase 2 of the DP World Brisbane Automatic Stacking Cranes (ASC) project has kicked off with a successful target delivery. The shipment carrying two new 9-wide ASCs arrived at DPW in project schedule and in perfect condition. The two ASCs were transported fully-erected from China to Australia and unloaded in Brisbane in July. This delivery completes Module 1 which is an addition to existing seven ASC modules. "The arrival of the vessel carrying two fully-erected ASCs was really impressive. DP World and Kalmar staff alike were excited to watch as the vessel pulled into the port. Kalmar would like to congratulate and thank everyone involved," comments Jyri Saarijoki, Project Director, Kalmar. He continues "The successful shipment of fully-erected cranes from China to Australia with efficient delivery onto the terminal is an important milestone for Kalmar and validates the method as an efficient and proven concept." The delivery of the two Kalmar ASCs marks the fourth successful fully erected ASC shipment from China to Australia. To date, Kalmar has provided DP World in Brisbane 16 Kalmar ASCs and 16 Kalmar shuttle carriers integrated with Navis N4 terminal operating system (TOS). The two new ASCs bring the number of modules servicing container trade to eight and increasing capacity by 14 percent to 720,000 TEU.